Sure, you have an author website—these days, what smart, proactive author doesn’t? As the marketing experts here at Web Design Relief have often said, an author website is now synonymous with “online business card.” But unlike a flat, unchanging paper business card, your author website shouldn’t be a static “poster” site, existing just to give information. Not only does a static writer website make your Google Analytics sink like a stone, it also defeats an important reason why many authors have a website in the first place: to sell books! Although it’s tempting to stuff your home page with every detail, an overload of information doesn’t offer direction. A smarter strategy is to focus on a single, clear call to action that directs readers toward what you really want them to do. For example, if you have a new or upcoming release, you’ll want readers to buy the book. Craft your call to action to funnel visitors toward online book sales. Use the imperative mood, such as: Read An Exclusive Excerpt Here, Buy Now, or Preorder Today! Use larger type, a box or border, and/or a pop of color to bring attention to the call to action. Writing marketing and promotion copy is a unique skill. A novelist who has written dozens of books may struggle to write a short, sizzling book blurb that makes the novel sound irresistible. Traditional publishing houses hire professional copywriters to do just that, because they know that good copy can make the difference between a skip and an online book sale. Take a good hard look at the text on your website to determine whether it’s effective for selling books. Because the road to a long and healthy writing career starts with gathering a tribe of fans, many author websites focus on building a mailing list rather than making an immediate sale. Use a prominent, front-and-center “Sign Up For My Newsletter” call to action to harvest the emails of fans who are already checking out your work. Some authors run monthly contests on their websites to entice readers to join their mailing lists. Even if selling your latest book is your primary call to action, you can also use a pop-up dialogue box to offer bonus material or other reader magnets in exchange for their email, without messing up the website design. Not everyone who lands on your home page is going to immediately buy your book or sign up for your newsletter. Beyond the primary call to action, an equally important purpose of your website is to parlay reader interest into more connections. Adding a flight of social media icons somewhere on your website makes connecting easier and will increase online book sales down the line. 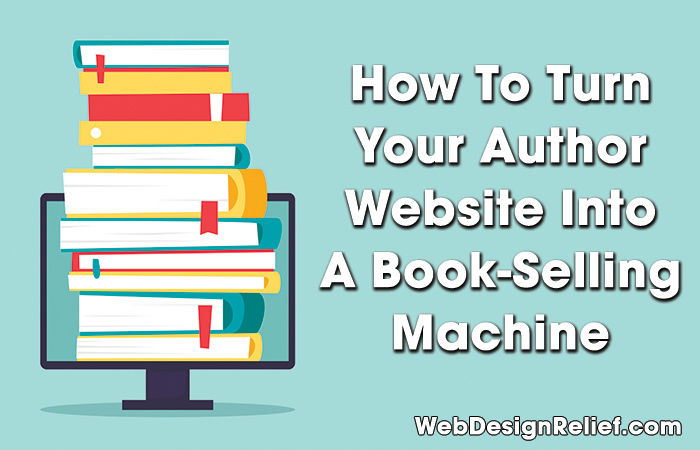 Many readers may arrive at your website with a very specific goal in mind, whether it’s figuring out the order of your series, determining which of your books they may not yet have read, or learning the time and place of your next personal appearance. Website design that offers clear menu navigation will put the necessary information at your visitors’ fingertips quickly. A professionally designed author website can be a powerful marketing and promotion machine to grow your online sales. If you’re considering starting or refreshing your writer website, make sure to choose a website designer who fully understands the unique challenges and needs of the book business—like Web Design Relief. Schedule your free consultation call today! Question: What’s the primary call to action on your author website home page?